Mostly to get myself hyped for the month ahead, I’m going to be doing a “What to be excited about this month” post to kick off each month. In typical blogging fashion, I will limit this to broad topics like sports, movies, and TV and not the things I’ll personally be looking forward to, like how much to procrastinate on filing my taxes (I still haven’t decided!!!). Feel free to see what you might&apos;ve missed in January, February and March, or read on. April is a tough month to be the preeminent athletic spectacle. Baseball&apos;s opening day on April 1 brings a certain joy. You have the Final Four on April 6 capping off my single favorite sporting event of the year in the NCAA Men&apos;s Basketball Tournament. April 20 sees the NBA Playoffs kick off. But for my money, the preeminent event of the month is the NFL Draft from April 25-27. Most college basketball fans have already seen their team fall before the month got here, and the MLB and NBA will never be more than than ugly stepsisters when standing beside the knockout (or at least concussive) appeal of the National Football League. In my uneducated opinion, it&apos;s a weak draft this year, but that doesn&apos;t change the fact that the NFL Draft lands symbolically in the spring, when every fan can dream that their new players usher in a new era. Look, I like things that are beautiful and confusing too. It&apos;s why I&apos;m a straight man. But if you think Upstream Color or To The Wonder were going to have me more excited than The Rock starring in the most anticipated movie of 2013 for a third straight month (I gave him the nod on Snitch & GI Joe: Retaliation), then maybe we should introduce you to your toebone just to be sure you understand what a grave mistake you&apos;ve made. Also, shout out to 42 because liking a movie about how we became more progressive 65 years ago seems to make you progressive today. And I&apos;m one progressive cat. 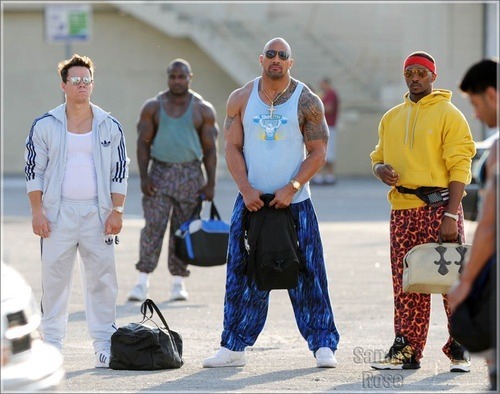 Pain & Gain premieres on April 26. How excited should you be? Go to the gym and hammer out five sets of six reps of squats as heavy as you can go. Do this every other day or until your legs big enough to have to wear the pants from the picture below. At that point, your excitement will be double that of the man with average testosterone levels. I didn&apos;t even look to see what other TV shows were coming out because this was a lock. I don&apos;t care that this trailer is comprised of only scenes from last season, and I don&apos;t care that I have literally no foresight of who Don Draper is becoming. I&apos;m just looking forward to making myself an old fashioned and being dismissive of female input while I watch the two-hour premiere on April 7. How excited should you be? It doesn&apos;t matter. You&apos;re as excited as you are. The next thing will be more exciting. "I&apos;m a patriot, boss. I&apos;ll be in by noon."